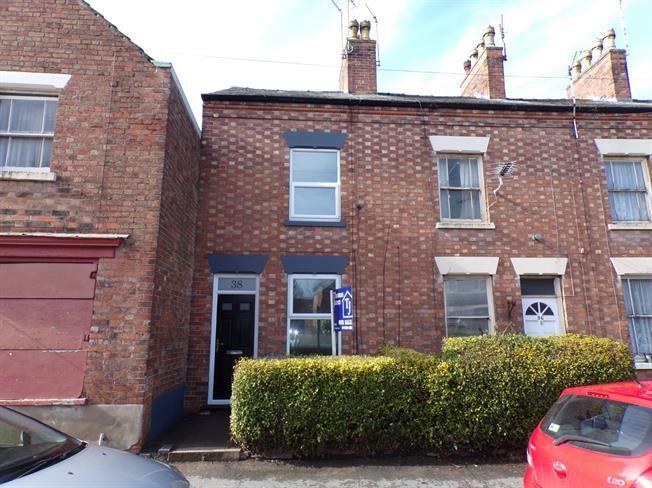 2 Bedroom Terraced House For Sale in Nottingham for Fixed Price £185,000. Two bedroom middle terraced house which has undergone a scheme of improvements by the current owner. The property benefits from a new fitted kitchen, new shower room, new carpets and decor and is centrally located in the heart of the village. The accommodation comprises entrance hall, lounge/diner, fitted kitchen, stairs to landing, double bedroom, shower room, stairs to master suite. Gardens to the front and rear. An early viewing is highly recommended. NO CHAIN. UPVC front double glazed door. Double aspect double glazed uPVC windows facing the front and rear. Radiator and electric stove fire, laminate flooring, storage cupboard, stairs to landing. UPVC back double glazed door. Double glazed uPVC window facing the side. Radiator, part tiled walls. Roll edge work surface, wall, base and drawer units, one and a half bowl sink, electric oven, electric hob, over hob extractor, space for washing machine. Double bedroom; double glazed uPVC window facing the front. Radiator, new carpeted flooring. Double glazed uPVC window with obscure glass facing the rear. Radiator, tiled walls. Low level WC, walk-in shower, pedestal sink. To the front there is a blue chipped area, hedge. Enclosed shared rear gardens comprising lawn, useful outbuildings housing wall mounted boiler.